Virtual Disk: Unprotect all files to a virtual disk. Faster than other methods. 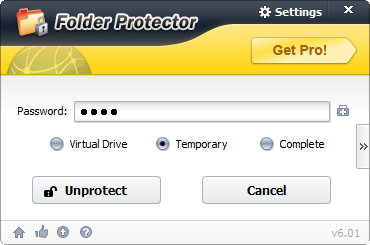 The folder will be reprotected as soon as you close the explorer window. Temporary: Show a restore window on your taskbar after unprotection. 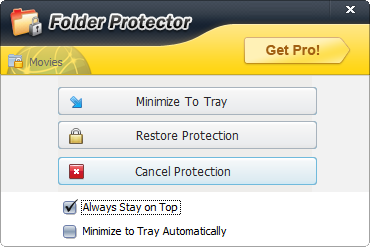 The folder protection can be restored easily. Complete: Completely unprotect your folder. You need to reenter your password to protect the folder next time.